This October there is a grumpy old grandpa on the loose! 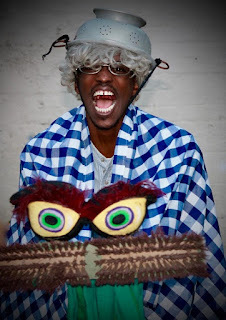 Written by Neil Coppen and starring the wonderful Straw Nzimande, Grandpa Grump and the Magical Junkshop is the perfect holiday delight for children of all ages, 4 to 400!! Make your way down to the Rhumbelow Theatre in Umbilo from October 1 to 5, 2018, and join Grandpa Grump on his quest to become SUPERGRUMP! He must rescue the rag doll, Molly; a special surprise for his granddaughter on her 6th birthday. To do so, he must face the many challenges that lie waiting in his Junkshop. Meet the terrifying Dustbin Monster, the nutty Cuckoo in the Cuckoo Clock, take a trip to the moon and back and appease the Smelly Sock Snake before scaring away the enormous and frightening Broomstick Dragon! Performances take place at 11h00 from October 1 to 5 and the show running time is approximately 55 minutes. There will be some fun co louring in afterwards for the youngsters and a colouring in competition. Snacks and juices will be on sale.